Samsung Electronics announced the addition of Deezer High Fidelity Lossless Audio on select Samsung soundbars and wireless speakers. Thanks to its partnership with Deezer, music fans and audiophiles can stream music and listen to tracks in the quality the way it was originally intended. While regular music streaming compresses music and reduces the overall sound quality, Deezer HiFi streams music at 16-Bit/ 44.1 kHz in lossless audio. This ensures the highest sound quality, perfect for music lovers that want to hear every single element of a track. In addition to the enhanced quality of sound, Deezer HiFi includes Flow, a personal soundtrack that uses smart data to play familiar favorites and new recommendations for users, as well as ad-free listening, unlimited music play and access to an extensive library of playlists, albums, music genres and more. Deezer HiFi users have unlimited access to 36 million HiFi tracks in more than 180 countries, with the service now available to Samsung users with a compatible wireless device. 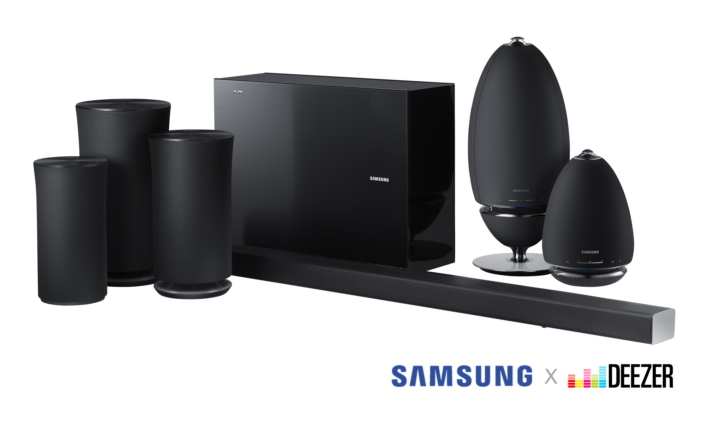 Samsung’s lineup of wireless speakers and soundbars are developed and tested at the Samsung Audio Lab, based in Valencia, California. For more information about the lineup, please visit www.samsung.com. Deezer connects 14 million monthly active users around the world to 53 million tracks. Available in over 180 countries worldwide, Deezer gives instant access to one of the largest and most diverse global music streaming catalogue on any device. Deezer is the only music streaming service with Flow, the unique mix of all your old favourites and new recommendations in one ever-changing stream. Based on an intuitive, proprietary algorithm and created by people who love music, it’s the only place to hear all your music back-to-back with fresh discoveries tailored to you. Deezer is available on your favorite device, including smartphone, tablet, PC, laptop, home sound system, connected car or smart TV.